Frontier Constitutions is a pathbreaking study of the cultural transformations arrived at by Spanish colonists, native-born creoles, mestizos (Chinese and Spanish), and indigenous colonial subjects in the Philippines during the crisis of colonial hegemony in the nineteenth century, and the social anomie that resulted from this crisis in law and politics. 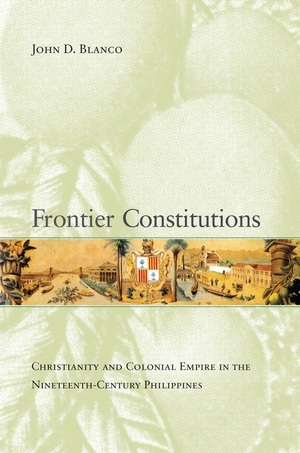 John D. Blanco argues that modernity in the colonial Philippines should not be understood as an imperfect version of a European model but as a unique set of expressions emerging out of contradictions—expressions that sanctioned new political communities formed around the precariousness of Spanish rule. Blanco shows how artists and writers struggled to synthesize these contradictions as they attempted to secure the colonial order or, conversely, to achieve Philippine independence. John D. Blanco is Assistant Professor of Comparative Literature at University of California, San Diego.